Hey All – I found the right dog finally! He IS discontinued, but there are a few out there on e-Bay and other stores on the internet. 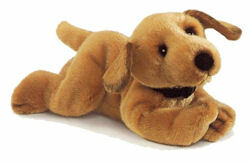 He is made by Russ-Berrie and is called Golden Retriever Puppy from their Purebred series. Of course I find this AFTER I ordered the wrong one. Hope this info helps others avoid the same mistake. Thanks to everyone that helped!! I think our dog might have been a little, just a hair darker in color than this one. It is really hard to tell if it is, due to the color setting on the computer, or the photo or whatever the case is not being able to see it in person. I also think the tail was not as curled as the one in the photo, and I think the black point of the dog’s nose we had was a little smaller. I just did not make hard mental notes, as I just did not think this was all that likely to happen. I ordered this Fetchit dog, because he does appear to be nearly identical to “Woof-Puppy”. I am still in contact with the hotel to see if anything turns up. This hotel has well over 2000 rooms, so it may take some time to actually find the bin of sheets he might be in. The replacement Fetchit I ordered should be here next week. Upon getting him in my hands, I’ll update you on whether this is the same as “Woof-Puppy” or not. It was NOT! On Oct 6th 2008, we were rushing to catch our plane and left “Woof-Puppy” in the bed at the New York Marriott Marquis hotel. He was wrapped in the sheets, and I am sure the housekeeper did not see him when she cleaned the room. Apparently, laundry is shipped to a service in New Jersey. The hotel has been diligently trying to locate him, but he is not found yet. I am beginning to lose hope. My son has had this dog since he was an infant. The dog is about 9-11 inches long in a kind of laying down on tummy position, but not completely prone. He is cinnamon in color and I believe he is a GUND. The plush is fairly short, as this is not a long haired puppy. I think he is discontinued. He was given to my son in about 2004 by a neighbor lady, who has since passed away. He was probably purchased in the Austin/Round Rock area. The closest item I could find was Mini Fetchit by GUND, but it is not 100% the same. I had seen the Mini-Mutsy and ruled her out. My son asks me several times every night for Woof-Puppy. It is heart-breaking. I have told him he is at the groomers and might come back looking a little differently than before. Woof-puppy makes no sound, he is just for cuddling. He is all one color with a black nose. -LisaIf you can help Lisa find this RUSS Purebred Series GOLDEN RETRIEVER Lying Down approx. 10″ CINNAMON DOG, THIS SITE IS NO LONGER ACTIVELY MANAGED. Please use Our FREE FACEBOOK GROUP, including #100808-1 in the subject, . It seems too furry to me, but I will pass the link along. Thanks Tonya!! Item number: 150268646182 ebay ?? Might be – I’ll send the link. I think Tanya had found the one dog on e-bay this last weekend 10/11. That one is too blonde and too big. I have ordered the mini-fetchit and it may be here either today or tomorrow. I will post here whether it is a match or not once I can see it in person. It it does match, maybe the info can help someone else. Thanks to everyone who looked for me. 380067778154 ebay – just in case. this one is not furry though.